I'm using the DRY plugin to display duplicated code found with Simian. The overview of all found code duplication pairs is working correctly (see 1). The first occurrence of a code duplication pair A - B is correctly displayed (see 2) however the second occurrence (see 3) B - A is empty. 1. Either file B should be completely removed from overview "1"
I checked https://issues.jenkins-ci.org/browse/JENKINS-16688 and it seems to be a similar issue. This is related to "■If a duplication is in two files, then on the left only one file is shown" which I think might be the best solution. 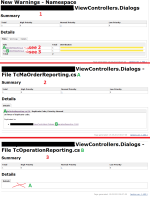 [FIXED JENKINS-17958] Fixed navigation to duplications. SCM/JIRA link daemon added a comment - 2013-09-12 22:45 Code changed in jenkins User: Ulli Hafner Path: clean.sh src/main/java/hudson/plugins/dry/parser/DuplicateCode.java src/main/java/hudson/plugins/dry/parser/cpd/CpdParser.java src/main/java/hudson/plugins/dry/parser/simian/SimianParser.java src/main/resources/hudson/plugins/dry/DryTabDetail/dry-details.jelly src/main/resources/hudson/plugins/dry/DryTabDetail/dry-warnings.jelly src/test/java/hudson/plugins/dry/parser/AbstractDuplicationParserTest.java src/test/java/hudson/plugins/dry/parser/cpd/CpdParserTest.java src/test/java/hudson/plugins/dry/parser/simian/SimianParserTest.java http://jenkins-ci.org/commit/dry-plugin/6b47152e304d65876dda1ae608b0426ef8b32bed Log: [FIXED JENKINS-17958] Fixed navigation to duplications. Most likely the same problem. Ulli Hafner added a comment - 2013-07-13 08:32 Most likely the same problem.